For the ships, see MV Arctic, SS Arctic, USS Arctic. For other uses, see Arctic (disambiguation). The nations with land within the Arctic region. The Arctic (/ˈɑːrktɪk/ or /ˈɑːrtɪk/)[Note 1] is a polar region located at the northernmost part of Earth. The Arctic consists of the Arctic Ocean, adjacent seas, and parts of Alaska (United States), Finland, Greenland (Denmark), Iceland, Northern Canada, Norway, Russia and Sweden. Land within the Arctic region has seasonally varying snow and ice cover, with predominantly treeless permafrost (permanently frozen underground ice)-containing tundra. 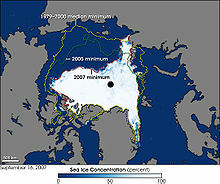 Arctic seas contain seasonal sea ice in many places. The Arctic region is a unique area among Earth's ecosystems. For example, the cultures in the region and the Arctic indigenous peoples have adapted to its cold and extreme conditions. Life in the Arctic includes organisms living in the ice, zooplankton and phytoplankton, fish and marine mammals, birds, land animals, plants and human societies. Arctic land is bordered by the subarctic. The word Arctic comes from the Greek word ἀρκτικός (arktikos), "near the Bear, northern" and that from the word ἄρκτος (arktos), meaning bear. The name refers either to the constellation Ursa Major, the "Great Bear", which is prominent in the northern portion of the celestial sphere, or to the constellation Ursa Minor, the "Little Bear", which contains Polaris, the Pole star, also known as the North Star. There are a number of definitions of what area is contained within the Arctic. The area can be defined as north of the Arctic Circle (66° 33'N), the approximate southern limit of the midnight sun and the polar night. Another definition of the Arctic is the region where the average temperature for the warmest month (July) is below 10 °C (50 °F); the northernmost tree line roughly follows the isotherm at the boundary of this region. The Arctic's climate is characterized by cold winters and cool summers. Its precipitation mostly comes in the form of snow and is low, with most of the area receiving less than 50 cm (20 in). High winds often stir up snow, creating the illusion of continuous snowfall. Average winter temperatures can go as low as −40 °C (−40 °F), and the coldest recorded temperature is approximately −68 °C (−90 °F). Coastal Arctic climates are moderated by oceanic influences, having generally warmer temperatures and heavier snowfalls than the colder and drier interior areas. The Arctic is affected by current global warming, leading to Arctic sea ice shrinkage, diminished ice in the Greenland ice sheet, and Arctic methane release as the permafrost thaws. Due to the poleward migration of the planet's isotherms (about 35 mi (56 km) per decade during the past 30 years as a consequence of global warming), the Arctic region (as defined by tree line and temperature) is currently shrinking. Perhaps the most alarming result of this is Arctic sea ice shrinkage. There is a large variance in predictions of Arctic sea ice loss, with models showing near-complete to complete loss in September from 2040 to some time well beyond 2100. About half of the analyzed models show near-complete to complete sea ice loss in September by the year 2100. Arctic life is characterized by adaptation to short growing seasons with long periods of sunlight, and to cold, dark, snow-covered winter conditions. Arctic vegetation is composed of plants such as dwarf shrubs, graminoids, herbs, lichens, and mosses, which all grow relatively close to the ground, forming tundra. An example of a dwarf shrub is the Bearberry. As one moves northward, the amount of warmth available for plant growth decreases considerably. In the northernmost areas, plants are at their metabolic limits, and small differences in the total amount of summer warmth make large differences in the amount of energy available for maintenance, growth and reproduction. Colder summer temperatures cause the size, abundance, productivity and variety of plants to decrease. Trees cannot grow in the Arctic, but in its warmest parts, shrubs are common and can reach 2 m (6 ft 7 in) in height; sedges, mosses and lichens can form thick layers. In the coldest parts of the Arctic, much of the ground is bare; non-vascular plants such as lichens and mosses predominate, along with a few scattered grasses and forbs (like the Arctic poppy). 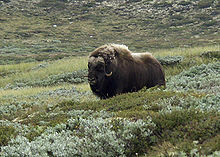 Herbivores on the tundra include the Arctic hare, lemming, muskox, and caribou. 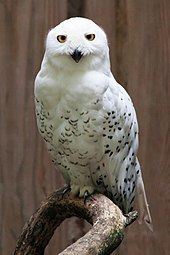 They are preyed on by the snowy owl, Arctic fox, Grizzly bear, and Arctic wolf. 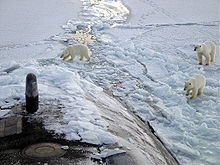 The polar bear is also a predator, though it prefers to hunt for marine life from the ice. There are also many birds and marine species endemic to the colder regions. Other terrestrial animals include wolverines, moose, Dall sheep, ermines, and Arctic ground squirrels. Marine mammals include seals, walrus, and several species of cetacean—baleen whales and also narwhals, killer whales, and belugas. An excellent and famous example of a ring species exists and has been described around the Arctic Circle in the form of the Larus gulls. The Arctic includes sizable natural resources (oil, gas, minerals, fresh water, fish and if the subarctic is included, forest) to which modern technology and the economic opening up of Russia have given significant new opportunities. The interest of the tourism industry is also on the increase. The Arctic contains some of the last and most extensive continuous wilderness areas in the world, and its significance in preserving biodiversity and genotypes is considerable. The increasing presence of humans fragments vital habitats. The Arctic is particularly susceptible to the abrasion of groundcover and to the disturbance of the rare breeding grounds of the animals that are characteristic to the region. The Arctic also holds 1/5 of the Earth's water supply. 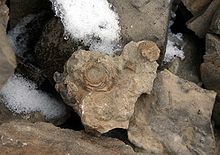 During the Cretaceous time period, the Arctic still had seasonal snows, though only a light dusting and not enough to permanently hinder plant growth. Animals such as the Chasmosaurus, Hypacrosaurus, Troodon, and Edmontosaurus may have all migrated north to take advantage of the summer growing season, and migrated south to warmer climes when the winter came. A similar situation may also have been found amongst dinosaurs that lived in Antarctic regions, such as the Muttaburrasaurus of Australia. However, others claim that dinosaurs lived year-round at very high latitudes, such as near the Colville River, which is now at about 70° N but at the time (70 million years ago) was 10° further north. Circumpolar coastal human population distribution c. 2009 (includes indigenous and non-indigenous). The earliest inhabitants of North America's central and eastern Arctic are referred to as the Arctic small tool tradition (AST) and existed c. 2500 BC. AST consisted of several Paleo-Eskimo cultures, including the Independence cultures and Pre-Dorset culture. The Dorset culture (Inuktitut: Tuniit or Tunit) refers to the next inhabitants of central and eastern Arctic. The Dorset culture evolved because of technological and economic changes during the period of 1050–550 BC. With the exception of the Quebec/Labrador peninsula, the Dorset culture vanished around 1500 AD. Supported by genetic testing, evidence shows that descendants of the Dorset culture, known as the Sadlermiut, survived in Aivilik, Southampton and Coats Islands, until the beginning of the 20th century. The Dorset/Thule culture transition dates around the 9th–10th centuries. Scientists theorize that there may have been cross-contact of the two cultures with sharing of technology, such as fashioning harpoon heads, or the Thule may have found Dorset remnants and adapted their ways with the predecessor culture. Others believe the Thule displaced the Dorset. By 1300, the Inuit, present-day Arctic inhabitants and descendants of Thule culture, had settled in west Greenland, and moved into east Greenland over the following century. Over time, the Inuit have migrated throughout the Arctic regions of Canada, Greenland, Russia, and the United States. Other Circumpolar North indigenous peoples include the Chukchi, Evenks, Inupiat, Khanty, Koryaks, Nenets, Sami, Yukaghir, Gwich'in, and Yupik. The Yupik still refer to themselves as Eskimo, which means "snowshoe netters", not "raw meat eaters" as it is sometimes mistakenly translated. Polar bears on the sea ice of the Arctic Ocean, near the North Pole. USS Honolulu pictured. 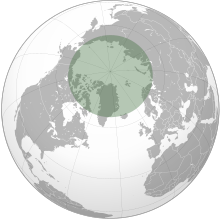 The eight Arctic nations (Canada, Kingdom of Denmark [Greenland & The Faroe Islands], Finland, Iceland, Norway, Sweden, Russia, and USA) are all members of the Arctic Council, as are organizations representing six indigenous populations. The Council operates on consensus basis, mostly dealing with environmental treaties and not addressing boundary or resource disputes. Though Arctic policy priorities differ, every Arctic nation is concerned about sovereignty/defense, resource development, shipping routes, and environmental protection. Much work remains on regulatory agreements regarding shipping, tourism, and resource development in Arctic waters. Research in the Arctic has long been a collaborative international effort, evidenced by the International Polar Year. The International Arctic Science Committee, hundreds of scientists and specialists of the Arctic Council, and the Barents Euro-Arctic Council are more examples of collaborative international Arctic research. 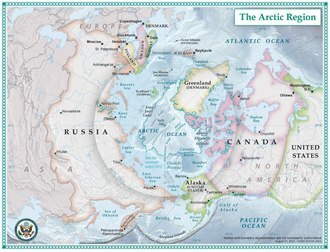 No country owns the geographic North Pole or the region of the Arctic Ocean surrounding it. The surrounding six Arctic states that border the Arctic Ocean—Canada, Kingdom of Denmark (with Greenland), Iceland, Norway, Russia, and the United States—are limited to a 200 nautical miles (370 km; 230 mi) exclusive economic zone (EEZ) off their coasts. Two Arctic states (Finland and Sweden) do not have direct access to the Arctic Ocean. Upon ratification of the United Nations Convention on the Law of the Sea, a country has ten years to make claims to an extended continental shelf beyond its 200 nautical mile zone. Due to this, Norway (which ratified the convention in 1996), Russia (ratified in 1997), Canada (ratified in 2003) and the Kingdom of Denmark (ratified in 2004) launched projects to establish claims that certain sectors of the Arctic seabed should belong to their territories. On 2 August 2007, two Russian bathyscaphes, MIR-1 and MIR-2, for the first time in history descended to the Arctic seabed beneath the North Pole and placed there a Russian flag made of rust-proof titanium alloy. The flag-placing during Arktika 2007 generated commentary on and concern for a race for control of the Arctic's vast hydrocarbon resources. Foreign ministers and other officials representing Canada, the Kingdom of Denmark, Norway, Russia, and the United States met in Ilulissat, Greenland on 28 May 2008 at the Arctic Ocean Conference and announced the Ilulissat Declaration, blocking any "new comprehensive international legal regime to govern the Arctic Ocean," and pledging "the orderly settlement of any possible overlapping claims." 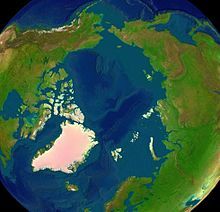 As of 2012, the Kingdom of Denmark is claiming the continental shelf based on the Lomonosov Ridge between Greenland and over the North Pole to the northern limit of the Russian EEZ. The Russian Federation is also claiming a large swath of seabed along the Lomonosov Ridge but, unlike Denmark, confined its claim to its side of the Arctic. In August 2015, Russia made a supplementary submission for the expansion of the external borders of its continental shelf in the Arctic Ocean, asserting that the eastern part of the Lomonosov Ridge and the Mendeleyev Ridge are an extension of the Eurasian continent. In August 2016, the UN Commission on the Limits of the Continental Shelf began to consider Russia's submission. Since 1937, the larger portion of the Asian-side Arctic region has been extensively explored by Soviet and Russian manned drifting ice stations. Between 1937 and 1991, 88 international polar crews established and occupied scientific settlements on the drift ice and were carried thousands of kilometers by the ice flow. The Arctic is comparatively clean, although there are certain ecologically difficult localized pollution problems that present a serious threat to people's health living around these pollution sources. Due to the prevailing worldwide sea and air currents, the Arctic area is the fallout region for long-range transport pollutants, and in some places the concentrations exceed the levels of densely populated urban areas. An example of this is the phenomenon of Arctic haze, which is commonly blamed on long-range pollutants. Another example is with the bioaccumulation of PCB's (polychlorinated biphenyls) in Arctic wildlife and people. There have been many proposals to preserve the Arctic over the years. Most recently a group of stars at the Rio Earth Summit, on 21 June 2012, proposed protecting the Arctic, similar to the Antarctic protection. The initial focus of the campaign will be a UN resolution creating a global sanctuary around the pole, and a ban on oil drilling and unsustainable fishing in the Arctic. The effects of global warming in the Arctic include rising temperatures, loss of sea ice, and melting of the Greenland ice sheet. Potential methane release from the region, especially through the thawing of permafrost and methane clathrates, is also a concern. Because of the amplified response of the Arctic to global warming, it is often seen as a leading indicator of global warming. The melting of Greenland's ice sheet is linked to polar amplification. The Arctic is especially vulnerable to the effects of any climate change, as has become apparent with the reduction of sea ice in recent years. Climate models predict much greater warming in the Arctic than the global average, resulting in significant international attention to the region. In particular, there are concerns that Arctic shrinkage, a consequence of melting glaciers and other ice in Greenland, could soon contribute to a substantial rise in sea levels worldwide. The current Arctic warming is leading to fears of ancient carbon being released from thawing permafrost, leading to methane and carbon dioxide production by micro-organisms. Release of methane and carbon dioxide stored in permafrost could cause abrupt and severe global warming, as they are potent greenhouse gases. Climate change is also predicted to have a large impact on Tundra vegetation, causing an increase of shrubs, and having a negative impact on bryophytes and lichens. Apart from concerns regarding the detrimental effects of warming in the Arctic, some potential opportunities have gained attention. The melting of the ice is making the Northwest Passage, the shipping routes through the northernmost latitudes, more navigable, raising the possibility that the Arctic region will become a prime trade route. One harbinger of the opening navigability of the Arctic took place in the summer of 2016 when the Crystal Serenity successfully navigated the Northwest Passage, a first for a large cruise ship. In addition, it is believed that the Arctic seabed may contain substantial oil fields which may become accessible if the ice covering them melts. These factors have led to recent international debates as to which nations can claim sovereignty or ownership over the waters of the Arctic. Eidsfjord in Vesterålen, Norway is 250 km (160 mi) inside the Arctic Circle, but the comparatively temperate Norwegian sea gives a mean annual temperature of 4 °C (39 °F) and a three-month summer above 10°C. ^ The word was originally pronounced without the /k/ sound, but the pronunciation with the k sound is nowadays very common. The "c" was added to the spelling for etymological reasons and then began to be pronounced, but (as with other spelling pronunciations) at first only by less educated people. ^ a b Company, Houghton Mifflin Harcourt Publishing. "The American Heritage Dictionary entry: arctic". www.ahdictionary.com. Retrieved 4 January 2019. ^ Christopher Krembs and Jody Deming. "Organisms that thrive in Arctic sea ice." National Oceanic and Atmospheric Administration. 18 November 2006. ^ Liddell, Henry George and Scott, Robert. "Arktikos." A Greek-English Lexicon. Perseus Digital Library. ^ Liddell, Henry George and Scott, Robert. "Arktos." A Greek-English Lexicon. Perseus Digital Library. ^ "The Great Bear Constellation Ursa Major". Archived from the original on 30 November 2010. Retrieved 10 November 2010. ^ "arctic." Dictionary.com Unabridged (v 1.1). Random House, Inc. Retrieved 2 May 2009. ^ Addison, Kenneth (2002). Fundamentals of the physical environment. Routledge. p. 482. ISBN 978-0-415-23293-7. ^ Hansen, Jim (19 October 2006). "The Planet in Peril – Part I". Yale Center for the Study of Globalization. Archived from the original on 15 October 2009. ^ Serreze, Mc; Holland, Mm; Stroeve, J (March 2007). "Perspectives on the Arctic's shrinking sea-ice cover". Science. 315 (5818): 1533–36. Bibcode:2007Sci...315.1533S. doi:10.1126/science.1139426. PMID 17363664. ^ "A paleontologists Alaskan adventure". New Scientist. 9 June 2012. ^ Hoffecker, John F. (2005). A prehistory of the north: human settlement of the higher latitudes. Rutgers University Press. p. 130. ISBN 978-0-8135-3469-5. ^ McGhee, Robert (2005). The last imaginary place: a human history of the Arctic world (Digitized 7 October 2008 ed.). Oxford University Press. p. 55. ISBN 978-0-19-518368-9. ^ "First Nations Culture Areas Index". the Canadian Museum of Civilization. ^ "Arctic Peoples". British Museum. ^ a b c Buixadé Farré, Albert; Stephenson, Scott R.; Chen, Linling; Czub, Michael; Dai, Ying; Demchev, Denis; Efimov, Yaroslav; Graczyk, Piotr; Grythe, Henrik; Keil, Kathrin; Kivekäs, Niku; Kumar, Naresh; Liu, Nengye; Matelenok, Igor; Myksvoll, Mari; O'Leary, Derek; Olsen, Julia; Pavithran, A.P., Sachin; Petersen, Edward; Raspotnik, Andreas; Ryzhov, Ivan; Solski, Jan; Suo, Lingling; Troein, Caroline; Valeeva, Vilena; van Rijckevorsel, Jaap; Wighting, Jonathan (16 October 2014). "Commercial Arctic shipping through the Northeast Passage: Routes, resources, governance, technology, and infrastructure" (PDF). Polar Geography. 37 (4): 298. doi:10.1080/1088937X.2014.965769. Archived from the original (PDF) on 5 December 2015. ^ Berkman, Paul (23 June 2014). "Stability and Peace in the Arctic Ocean through Science Diplomacy". Science & Diplomacy. 3 (2). ^ "United Nations Convention on the Law of the Sea (Annex 2, Article 4)". Archived from the original on 16 July 2007. Retrieved 26 July 2007. ^ a b c d "Chronological lists of ratifications of, accessions and successions to the Convention and the related Agreements". United Nations Division for Ocean Affairs and the Law of the Sea. 22 April 2009. Archived from the original on 14 April 2009. Retrieved 30 April 2009. ^ Yenikeyeff, S. M. and Fenton Krysiek, Timothy (August 2007). The Battle for the Next Energy Frontier: The Russian Polar Expedition and the Future of Arctic Hydrocarbons. Oxford Institute for Energy Studies. ^ "The Ilulissat Declaration" (PDF). Ministry of Foreign Affairs of Denmark. 28 May 2008. Archived from the original (PDF) on 26 June 2008. Retrieved 6 June 2008. ^ Boswell, Randy (28 May 2008). "Conference could mark start of Arctic power struggle". canada.com. Archived from the original on 4 March 2009. Retrieved 6 June 2008. ^ "Dansker vil dokumentere territorialkrav i Arktis" (in Norwegian). NRK. 28 July 2012. Retrieved 15 June 2015. ^ "Russia claims the application for expansion of Danish borders in the Arctic shelf". 23 January 2017. ^ "North Pole drifting stations (1930s–1980s)". Woods Hole Oceanographic Institution. Retrieved 30 April 2009. ^ Stars launch campaign to save the Arctic. Greenpeace (21 June 2012). ^ Tedesco, M.; Mote, T.; Fettweis, X.; Hanna, E.; Jeyaratnam, J.; Booth, J.F. ; Datta, R.; Briggs, K. (2016). "Arctic cut-off high drives the poleward shift of a new Greenland melting record". Nature Communications. 7: 11723. Bibcode:2016NatCo...711723T. doi:10.1038/ncomms11723. PMC 4906163. PMID 27277547. 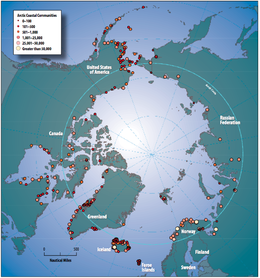 ^ Impacts of a warming Arctic: Arctic Climate Impact Assessment. Cambridge, UK: Cambridge University Press. February 2005. doi:10.2277/0521617782 (inactive 15 March 2019). ISBN 978-0-521-61778-9. Archived from the original on 19 November 2006. Retrieved 20 November 2006. ^ Grinberg, Emanuella (17 December 2008). "Ice melting across globe at accelerating rate, NASA says." CNN. ^ Lenton, T.M. ; Held, H.; Kriegler, E.; Hall, J.W. ; Lucht, W.; Rahmstorf, S.; Schellnhuber, H.J. (2008). "Inaugural Article: Tipping elements in the Earth's climate system". Proceedings of the National Academy of Sciences. 105 (6): 1786–93. Bibcode:2008PNAS..105.1786L. doi:10.1073/pnas.0705414105. PMC 2538841. PMID 18258748. ^ "Abrupt Climate Change Focus Of U.S. National Laboratories". Science Daily. 23 September 2008. ^ Myers-Smith, Isla H.; Forbes, Bruce C.; Wilmking, Martin; Hallinger, Martin; Lantz, Trevor; Blok, Daan; Tape, Ken D.; Macias-Fauria, Marc; Sass-Klaassen, Ute (1 January 2011). "Shrub expansion in tundra ecosystems: dynamics, impacts and research priorities". Environmental Research Letters. 6 (4): 045509. Bibcode:2011ERL.....6d5509M. doi:10.1088/1748-9326/6/4/045509. ISSN 1748-9326. ^ Alatalo, Juha M.; Jägerbrand, Annika K.; Molau, Ulf (1 November 2015). "Testing reliability of short-term responses to predict longer-term responses of bryophytes and lichens to environmental change". Ecological Indicators. 58: 77–85. doi:10.1016/j.ecolind.2015.05.050. 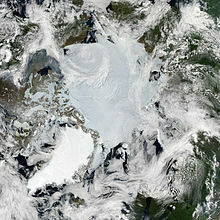 ^ "Will ice melt open fabled Northwest Passage?" Archived 9 November 2007 at the Wayback Machine CNN. 29 August 2002. ^ "Largest Cruise Ship Ever To Sail Northwest Passage Docks In NYC". 16 September 2016. Retrieved 24 September 2016. ^ Demos, Telis. "The great Arctic Circle oil rush." CNN. 8 August 2007. ^ Shaw, Rob. "New patrol ships will reassert northern sovereignty: PM". Victoria Times Colonist. 9 July 2007. ^ Halpin, Tony. "Russia stakes its claim on North Pole in underwater search for oil". The Times. 28 July 2007. ^ "Conference could mark start of Arctic power struggle". Canada.com. 28 May 2008. Archived from the original on 4 March 2009. ^ Stokmarknes in Vesterålen 1961–1990 average. Retro.met.no (28 January 2008). Retrieved 2011-10-18. Gibbon, Guy E.; Kenneth M. Ames (1998). Archaeology of prehistoric native America: an encyclopedia. Volume 1537 of Garland reference library of the humanities. Taylor & Francis. ISBN 978-0-8153-0725-9. Krupnik, Igor, Michael A. Lang, and Scott E. Miller, eds. Smithsonian at the Poles: Contributions to International Polar Year Science. Washington, D.C.: Smithsonian Institution Scholarly Press, 2009. Käpylä, Juha & Mikkola, Harri: The Global Arctic: The Growing Arctic Interests of Russia, China, the United States and the European Union FIIA Briefing Paper 133, August 2013, The Finnish Institute of International Affairs. O'Rourke, Ronald (14 October 2016). Changes in the Arctic: Background and Issues for Congress (PDF). Washington, DC: Congressional Research Service. Retrieved 20 October 2016. Sperry, Armstrong (1957). All About the Arctic and Antarctic. Random House. LCCN 57007518.